In my previous post “Changing the landscape for Foreign Films” we discussed how we now have more access to foreign films because of all the available streaming services. We are able to look for old classic films as well as the most recently released films. Now, what should we see then? Well, there are a lot of good movies out there to see. For that reason, we will start a series of Interesting Foreign Sci-Fi and Fantasy Films to look out for. Let’s take a look at the first set of 5 interesting Foreign Sci-Fi & Fantasy movies. The Seventh Seal tells the story of a medieval knight Antonius Block, played by Max von Sydow, as he plays a game of chess with the personification of Death, played by Bengt Ekerot. This personification of Death is a pale white-faced man who wears a dark black cape, resembling a monk, who has come to take Antonius’s life. The film received both positive and negative reviews from Swedish critics but internationally the film received critical acclaim especially for its cinematography and acting. The film is now regarded as a classic masterpiece of cinema and for someone of the greatest movies of all time. Moreover, the Vatican included the film into its list of 45 greatest films for its thematic values. 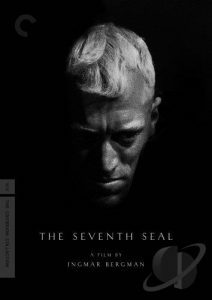 The Seventh Seal had a symbolism with its reflections on the meaning of life and death that were immediately interesting concepts to study as literature by the intellectual audience. The film influenced the interpretation of Death in many movie genres. The most popular is the representation of Death as a skeleton or a pale-faced man who wears a black cape and plays chess with mortals in comedy films and television. Solaris is an adaptation of the novel of Stanislow Lem of the same name published in 1961. Co-written and directed by Andrei Tarkovsky this adaptation is more about the inner lives as human beings of the scientist studying Solaris’ mysterious ocean. The director wanted the story to be emotional and intellectual and therefore it’s centered around Kelvin’s feelings and the impact of outer space exploration on the human body and mind. The film tells the story of a scientific mission at the space station orbiting the remote oceanic fictional planet Solaris. After many decades the mission has not progressed because of what seems to be a communication problem. The crew is sending incomprehensive messages. Psychologist Kris Kelvin is sent to the space station to evaluate the situation and determine whether the mission should continue. Solaris was released in 1972 at the Cannes Film Festival and won the Grand Prix du Jury. In the USSR, the film was released on 1973 and screened in limited runs for 15 years without any breaks given it a cult status. The film was released a few years later in the East and the West of the world. 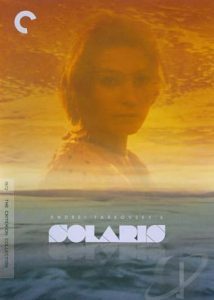 In the U.S. a version of Solaris was released in 1976 but it was shortened with 30 minutes. This film is often referred to as one of the greatest Sci-Fi films in history of cinema. Moreover the film was selected for screening at the 2016 Cannes Film Festival as part of the Cannes Classics Collection. In 2002 Hollywood created his own adaptation of Solaris (1961). Language: German, English, French, Turkish, Hebrew and Spanish. 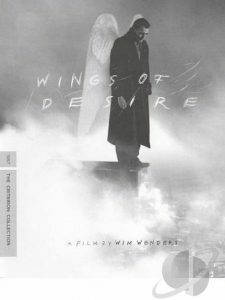 Wings of Desire is centered on the angels that watch over Berlin. These angels are immortal and invisible to humans. They listen to the thoughts of human and comfort those who are grieving or in distress. Angel Damien, played by Bruno Ganz, falls in love with Marion, a lonely trapeze artist, played by Solveig Dommartin. Damien decides to become human to experience human emotions so he can discover human love with Marion. The story was inspired by Rianer Maria Rilke’s poetry, the angel-themed artwork in cemeteries and around the city of Berlin, and a back-story in which God exiled his angels to Berlin as punishment for defending humans in 1945. The story has some similarities to the fallen angel story but it’s not related to evil. The story also presents libraries as important places that conserve memories and literacy. The story in the film is also a representation for German unification of the East and the West, presented as the unity of angel and human or the unity of man and female. The angels watched over the East and the West equally and where not influenced by the symbolism of the wall. In the film there are actual locations of West Berlin, some of which may have been destroyed or changed. The wall was recreated because filming the true wall was against the law at that time. The film was shot in black & white (monochrome) and in color. The black & white represented the angles’ point of view as they can’t see colors. And colors represent the human point of view. Another interesting fact is that female lead learned trapeze and ropes moves and did all the work herself, without a stunt double. The film was first released at the Cannes Film festival in 1987. The film received many positive reviews and was a commercial success. The film won Best Director at the Cannes Film Festival in 1987 and continued its successful road across Europe winning more awards. 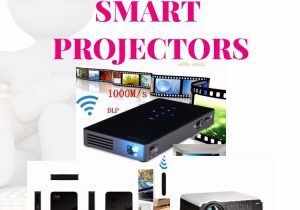 It’s important to mention them to give you an idea of the quality of the film. With so many award nominations and wins, you would imagine it would have been nominated for the Academy Awards right? Well, unfortunately, that didn’t happen. It was submitted by West Germany for consideration for Best Foreign Language Film but it was not considered because at that time the Academy did not recognize West German Cinema. The sequel “Faraway, So Close!” was released in 1993 which explored Berlin post-reunification. As years go by the story still alive through theater plays and stage adaptations. In Prague, Czech Republic, there is an office complex called “Zlatý Anděl or the Golden Angel”, designed by Jean Nouvel and completed in 2000, with an image of an angel from the film watching over the Angel crossroads (Anděl crossroad). A U.S. remake was released in 1998 titled “City of Angels” where the story is taken place in Los Angeles instead of Berlin and the female lead is a doctor instead of a trapeze artist. 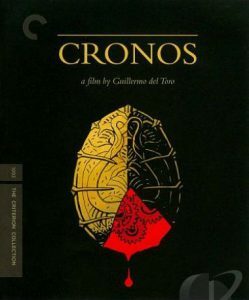 Cronos was the first feature film of Guillermo del Toro was writer and director. The story is centered on a mechanical artifact developed by an alchemist in Veracruz in 1536 that could give eternal life. The alchemist who had marble white skin was killed in 1937 when an old building collapsed and scattered pieces pierced through his heart. At the scene, investigators found basins filled with blood from a corpse. Centuries later an old antique dealer finds the mechanical object at the base of an archangel statue. After touching the object a golden scarab-sharp device, it suddenly gets spider-like legs that grabs him and injects him with something. That something will change or better said improve/prolong his life and his eating habits. The film received many positive reviews. Many liked the balance they achieved between horror and drama. Others praised the originality of the story and the acting. 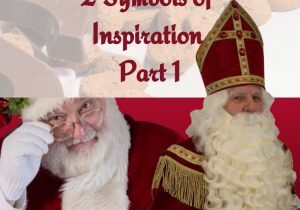 The film also has a strong mythology and religious references. The film is visually stylish, charming, emotionally engaging and appeals to the intellectual audience. Crouching Tiger, Hidden Dragon is based on the fourth novel of the same name, in the Wuxia book series “Crane Iron Pentalogy”, by Wang Dulu. The story follows the relationship between Li Mu Bai, played by Chow Yun-fat, an accomplished Wudang swordsman and Yu Shu Lien, played by Michelle Yeoh, a female warrior and professional bodyguard and all the drama around it. Don’t worry it may seem like a telenovela but there are amazing martial arts and fight sequences in the film. This film may be one of the most popular Chinese films that broke box office records and received 10 Academy Award nominations including Best Foreign Language Film, Best Picture, Best Director, Best adapted screenplay, Best original song, Best Costume Design, Best Art Direction, Best Film Editing, Best Original Score and Best Cinematography. The film won the Academy Awards for Best Foreign Language Film, Best Art Direction, Best Original Score and Best Cinematography. There you have them! The first 5 interesting Foreign Sci-Fi & Fantasy films to see. Have you ever watched any of these foreign films already? If you have not seen any of the above-mentioned films, will you consider watching (one) them? 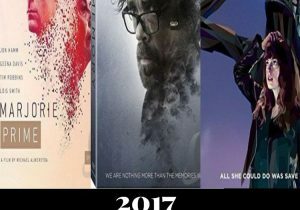 If yes, which one would you watch? 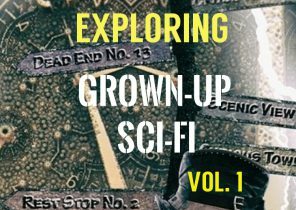 Click here for the next post with the second batch of interesting Foreign Sci-Fi and Fantasy films. Stay tuned for more titles in upcoming posts. Oh thank you for the share ! I’m kind of bored with Netflix new age movies and now I have some classic to watch 🙂 Thumbs up and keep them coming ! 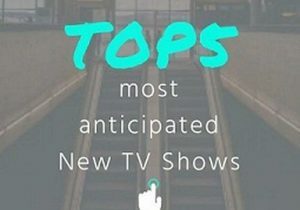 I am glad you enjoyed it and am curious to know which one you are planning to watch? The new age films as you mentioned are not bad either. Netflix is producing its own films and makes collaboration possible between different countries who usually don’t work together. Fortunately now we have access to films made around the world which means that you will have different styles of cinema to watch. I actually did not know all the movies except the last one! But thank you for the post because now I think I know what to watch when I am free! I am interested to watch the first one and the second one though. Really like the concept of both movies. 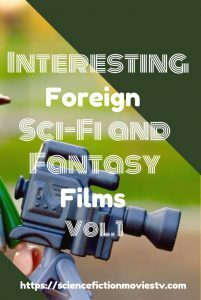 The main reason for this post is to help expose more foreign films that are out there, now that we have the resources (online streaming services) to get them. I am happy that by reading it got you interested in these movies. When you’re done watching them please let me know what you think from them. To be honest, I haven’t watched many foreign sci-fi movies. I think that the only reason being the fact that sometimes it is hard to find an interesting one which deserves the watch. I am not saying that such movies don’t exist but it can be hard to find them since I believe that they are not so well marketed. From the list you describe in this article I have watched only Crouching Tiger, Hidden Dragon. It is one of my favorite Asian movies. It is so pity that the sequel didn’t live to its high expectations. Cronos look promising and I’l definitely give it a try. Before we had the streaming services available we hardly knew about any foreign movies. So I think many of us had the same problem you had of not knowing that a film has been released. Another problem at least in my country that even though those films get released they stay very short at the cinema because most of it is reserved for the Hollywood Films. The marketing is another problem: its really hard to compete with a big budget market. Foreign films hardly reach the budget level in the U.S or England. Thankfully we have streaming services now that facilitates the marketing of movies. At least now we can look for information on foreign movie and actually find them to watch, that’s an advantage we now have with streaming services and social media. Crouching Tiger was very popular worldwide mainly because of its popularity in the U.S. Most people have seen it or at least know of it. 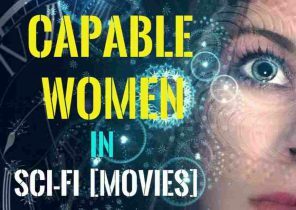 There are interesting sci-fi and fantasy movies out there we just don’t know about them. For that reason I started with these series to put some in the spotlight.